Before I write about course conditions etc… please accept my apologies for the lack of new posts (updates) recently. Needless to say, it’s been a pretty brutal summer weather wise. The combination of heat/drought has made the past couple months very challenging with regard to maintaining a golf course…I’ll try to do a much better job keeping you updated now that the cooler days of late summer are in sight. Don’t get me wrong, the last thing I want to do is come off as a weather winer…especially considering I’m only managing an area of land that’s used for leisure activity. Farmers who have lost complete crops, landowners whose homes have been destroyed by wildfires, and firefighters trying to contain those wildfires…now those are the people who deserve pity for what they’ve gone through this summer. Ok, now a little more about what’s happening at Hilldale GC. I’m very pleased with the condition of the greens. All putting surfaces have come through the summer in good shape. In fact, now that we only need worry about brief hot periods (like this weekend); not week upon week of severe heat, we (Hilldale’s grounds dept.) can get on with the fun business of prepping the golf course aggressively. I’m referring to things like: double cutting and double rolling greens, lower mowing heights on greens, tees, and fairways, and other practices we have to be very careful with or simply not do during extreme hot periods. FYI, greens now are cut daily with double-cutting used on weekends. They are rolled several times per week with the occasional double-roll employed when an extra .5 or 1 ft. is needed on the stimpmeter. We’re back to mowing tees and fairways 3-4 times per week after mowing only 1-2 times per week from 6/15 thru 8/1. There are thin areas on several tees and fairways that will need overseeding in the coming weeks (we hope to start next week). Overall, I’ve been pleased with conditions on all the fine turf areas…considering the summer weather. Obviously, the rough at Hilldale is very weak/thin heading into autumn. The combination of heat/drought/cart traffic has been very hard on the Kentucky bluegrass rough. KBG is a great turfgrass (as many of you know from home lawncare), so I definitely expect our rough to come back strong with the aid of fertilizer, fall rains (I hope), and again, cooler temps. Our irrigation system only covers small areas of rough therefore most of it went dormant many weeks ago. Speaking of irrigation water..at Hilldale our water supply comes from a well on the property. The well water is pumped into the small lake on hole #10 and subsequently pumped into the irrigation system throughout the golf course’s greens, tees, and fairways. Every attempt is made to conserve our natural resources so even during severe droughts like this we try to limit irrigation cycles to 2 nights per week. 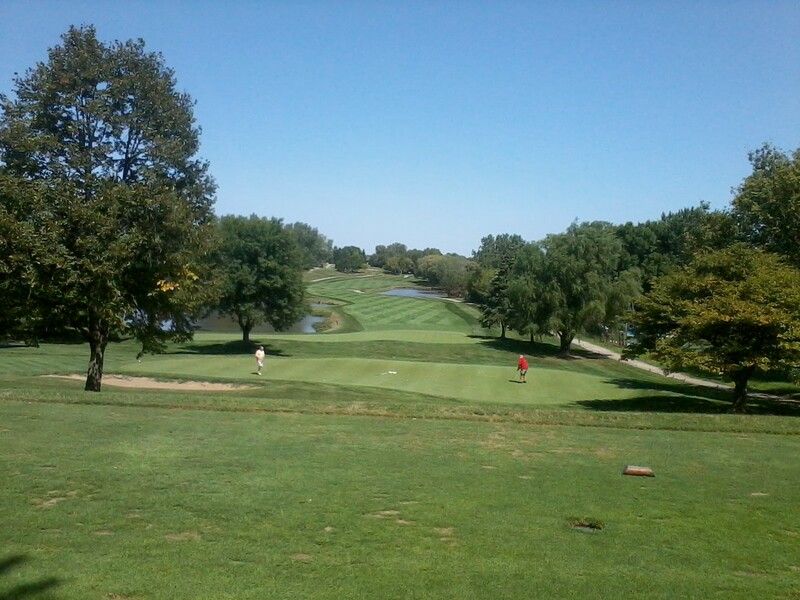 Thank you for helping make this a successful summer at Hilldale, I hope to see you out on the course this fall. Sorry again for the low number of course condition updates lately… I’ll definitely do better going forward. Sincerely, B.W. This entry was posted on Thursday, August 23rd, 2012 at 9:22 pm and is filed under Uncategorized. You can follow any responses to this entry through the RSS 2.0 feed. You can leave a response, or trackback from your own site.